Make sure you are aware of the things you must know! Your environment is usually created when you take a class that requires work on the server. This is a type of remote connection but normally only uses a command line text interface. Ask the instructor to set up an account for you. 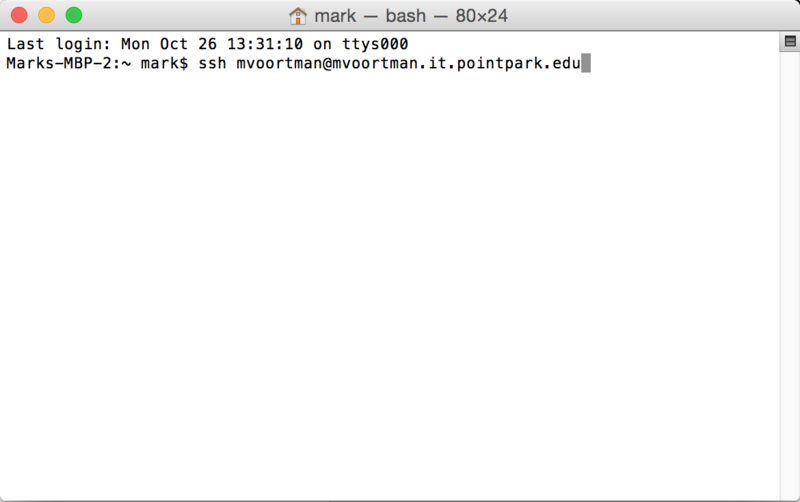 Your environment is identified with your Point Park username. Tip: Connecting to your environment is very similar to setting up a remote desktop connection, but then without the graphical user interface. In both cases you will be prompted for your password. Your initial password is the same as your username initially, but you will be forced to change it immediately. Note: You should pick a password that is hard to guess and you do not use anywhere else! Below are screen shots of both PuTTY (left) and a terminal window (right) with the required information filled out (click on them for a larger version). Note that you have to replace all occurrences of mvoortman with your username. Select No for the first dialog, then America, and scroll down almost all the way to the bottom for the United States. Next select Eastern Time (or whatever is appropriate) and confirm by selecting Yes. After running date again it should show the correct timezone. It is recommended that you create your homepage by following this tutorial. Also make sure to check out the command line tips. The video states I should use my seven character username,@username in Putty. This is not working for my account. Do you have other putty settings, or can someone check my username and pass. I will be unable to complete my assignment with this resolved. Ah, it looks like your environment/jail was never created (perhaps you joined late and this was an oversight?). I’ve just created it for you and it should work now. Please try. Thank you. Your correct I was a late addition to the class. I can now logon properly and perform the setup tasks. Thanks again. My password isn’t working. I must not remember it correctly from my class in the fall. Because my username and what I thought was my password both aren’t working. You should have received a new password by email. I am receiving an error that the Host Name does not exist. I do not even get to the password prompt. I’m using the PuTTY GUI and not the command line. It looks like no environment/jail was created for you yet. I just added it so can you try again? 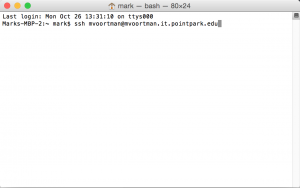 I ended up being able to login with userid.it.pointpark.edu versus the userid@userid.it.pointpark.edu, but the screenshot above shows the longer address. It works now though, so thank you. Both the long and short version should work. The difference is that the short version will ask for your username and password, and the long version will only ask for your password (since the username is already provided before the @). When I try to log on I am getting access denied. I am using macOS terminal. Are you running ‘ssh erolan@erolan.it.pointpark.edu‘? Are you sure you entered the correct password? Yes. I’ve never setup av password, so I used my username of erolan. I reset your password. You should have received an email about it. I forgot my password. Could you please set a new password for me?